Established 1832 by Rev. Alfred Wright and wife Harriet, who served as missionaries to Choctaws over 30 years. Rev. 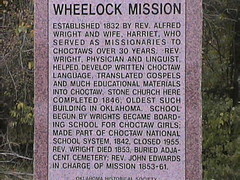 Wright, physician and linguist, helped develop written Choctaw language, translated gospels and much educational materials into Choctaw, Stone church here completed 1846, oldest such building in Oklahoma. School begun by writes became boarding school for Choctaw girls; made part of Choctaw National school system 1842, closed 1955. Rev. Wright dies 1853; burried adjacent cemerery; Rev. John Edwards in charge of mission 1853-61. "What the Hell's in Hugo?"